If the lack of a 3-Way Color Correction interface has been holding you back from adopting DaVinci Resolve for Mac – BlackMagic has listened and given you what you’ve been asking for. Behold the new 3-Way Color Tab – released on July 22, 2011 for both Resolve and the free Resolve Lite (see my accompanying blog post about Resolve Lite). This tab was designed specifically to free Resolve from needing a hardware colorist control surface (which cost between $1500US to $30,000US – depending on the model and manufacturer). It also frees BlackMagic from herding the hundreds of support calls they otherwise would have gotten if they released DaVinci Lite without this interface. Frankly, I never recommended Resolve for mouse-based colorists – the enhancements offered by Resolve wouldn’t make up for being limited to RGB-only tweaks. And while the Curves interface could certainly fill the gap missing from the 3-Way Color Corrector – it’s a bit too ‘twitchy’ and not as refined as on the Avid Symphony to make curves your primary color balance control. Also added with this new interface are a bunch of modifier keys to make mouse-based grading more productive. Tao of Color is part of the DaVinci Resolve Beta team but purchased Resolve at full retail price and has not received compensation, goods, or services from any 3rd Party mentioned in this post. We hope, one day, this might change. Affiliate links are used throughout this website, sometimes resulting in a commission on sales (which helps support TaoOfColor.com) but without raising the price you pay by one cent. DaVinci Resolve Lite includes all the same high quality processing of the fullÂ DaVinci Resolve. However it limits projects to HD resolutions or less, onlyÂ two color correction nodes, a single processing GPU and a single RED rocketÂ card. Stereoscopic 3D features, noise reduction, Power Mastering, remoteÂ grading, and sharing projects using an external database server are featuresÂ only offered in the full DaVinci Resolve and so are not included in this freeÂ DaVinci Resolve Lite edition. Customers who want to eliminate theseÂ restrictions can purchase the full DaVinci Resolve Software for only US$995. The removed features seem pretty reasonable. The 2-node restriction doesn’t allow for the more complicated Parallel, Key, and Mix nodes – which are ‘power user’ features. Yet it still supports a GPU + Red Rocket card. BlackMagic has struck a nice balance between giving away a very powerful color grading solution but holding back enough key features that owners of the paid versions won’t complain too much. The download can be found here. 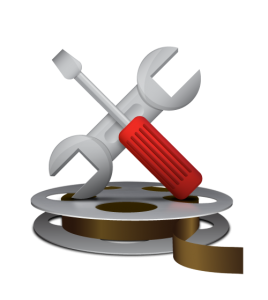 Select MacOS > DaVinci Resolve > DaVinciÂ Resolve Lite then fill in your details to download this free app. This Lite version is pretty big news but don’t lose sight of a brand new interface that makes this Lite version much moreÂ accessibleÂ to the people most likely to use it… mouse-only desktop colorists. That’s right, this new version of both Resolve for Mac and Resolve Lite now include a new 3-Way Color Panel. See my accompanying blog post about the new 3Way interface and the modifiers you can use with it to enhance your experience grading with a mouse on Resolve. The MacBook Pro contains two GPUs; one for high performance graphics and the other for better battery life. It is essential to enter the Energy Saver preferences, in the System Preferences of Mac OS X, and select the high performance graphics option. Failing to do so will render Resolve unusable. On the mid 2009 model, set the Graphics radio button to â€œHigher Performanceâ€. On the mid 2010 and early 2011 models, disable the â€œAutomatic graphics switchingâ€ checkbox. What About Mac OS Lion? According to an email I received from BlackMagic – Resolve 8.0.1 and Resolve Lite 8.0.1 Public Beta are both Lion-ready. Decklink users should update to the latest drivers, which are also Lion-ready. I myself haven’t had time to test it. I suggest running these configurations on a separate boot drive or partition to make sure everything is working properly before putting it into a production situation. Has Apple’s Color Been Merged Into Final Cut Pro X? “The Tao of Color Grading” was named and born from a simple question: Why do professional colorists work the way they do and how can we pass that knowledge forward? The ‘Tao Of Color’ mission is to explain ONLY the buttons, knobs, and levers we *actually use* – and explain how and why we use them the way we do. Apple’s latest release, Final Cut Pro X presents something of a challenge for us – since no one has actually used the software (beyond a small hand-picked group)… so how does this website evaluate the color grading abilities of FCPx X v1.0 immediately after its release? I’ve decided to frame this initial review this way: Has FCPx absorbed the color correction tools of Apple Color (which seems to have been End Of Life’d) and are they faster and more powerful than those of FCP 7? For the uninitiated, Apple Color’s advantage over color correcting inside FCP (or almost any other NLE) can be stated thusly: Color allows you to work faster, with better results, often at higher quality. It’s a simple value proposition (and is also true for DaVinci Resolve (by the way, training for Resolve 8 is forthcoming)). Does the FCPx native color correction workflow allow us to work faster with better results when compared the FCP 7 color correction workflow (I’ll leave quality considerations for after I’ve had more time on the app)? And while answering that question, we’ll take a quick tour of the new features and do some one-to-one comparisons. Where do we start?Â Easy – we start with the fundamentals: The color processing model. In the world of video color grading – there are two widely used color processing models: ‘YUV’ (technically in digital workflows it’s usually defined (sometimes incorrectly) as Y’Cb’Cr’ Â – but YUV is close enough for this conversation) and RGB. Final Cut Pro versions 1 – 7 were based on YUV. 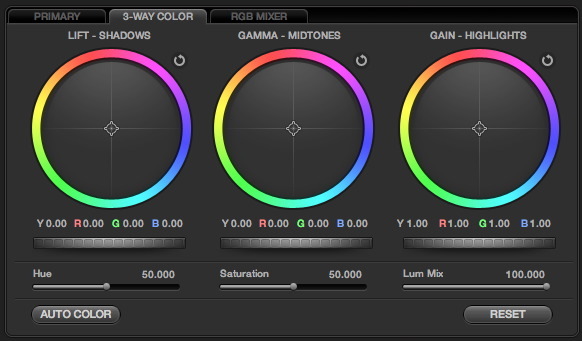 FCPx is based on RGB. What does this mean to the colorist, in practical terms? In YUV, brightness adjustments dramatically effect Saturation – but Saturation and Hue adjustments have essentially zero effect on Brightness (except on extreme adjustments). Why does it work this way? It’s based on math. In an upcoming video series I’ll be demonstrating this in detail. For now remember this: Until June 21, 2011 (the day FCPx launched) my advice to anyone color grading with the Final Cut native filter set was to start with your brightness / contrast adjustments, then work your color / hue adjustments, then bounce between all of them to fine tune. It’s a fast,Â efficientÂ workflow choice that minimized us chasing our tails. Final Cut Pro X changes this advice. In RGB color models, it doesn’t really matter which controls you start with since Brightness / Contrast / Hue / Saturation all interplay with each other. It’s more of a juggling act. While I still prefer to start with Brightness / Contrast adjustments there’s no mathematical reason to impose my preference upon new colorists. I have a strong personal opinion about it… but it’s just an opinion. Incidentally, Colorists who prefer how Red Giant’s Colorista II responds to their inputs will feel very at home in the FCPx color model (assuming they also like the new Color Board), since Colorista does its math in RGB (as does Apple Color and DaVinci Resolve). In many ways, the YUV color model is appropriate for mouse-driven interfaces where only one input can be adjusted at a time. In FCPx’s RGB color model (where tweaking one parameter forces continual re-tweaks of other parameters) – having an iPad at your side with something like Nattress’ $25 Chromagic iPad app (when it works with FCPx) should be a big help to mouse-driven FCPx colorists. When it comes to interfaces, Tao Colorists give a lot of weight to color-neutral, dark interfaces. Why? Because Tao Colorists are annoyingly principled about non-controlled light sources. For a decade, FCP’s bright, light interface was an annoyance. FCPx scores high on first impressions: The interface is dark, muted and with the filmstrips turned off, not overly colorful. Importing the footage from the Tao Of Color Masterclass series, I had FCPx analyze for color balance. FCPx took about 45 minutes to import, analyze, and transcode 18 minutes of h.264 HDSLR 1080p footage. What’s interesting is that the autobalance doesn’t seem to take into account the facial recognition. Given that skin tones fall into such a narrow range, there’s a huge opportunity for a facial recognition algorithm to feed color data to the Analyze for Color Balance function to make for some potentially outstanding initial grades. Hopefully Apple will consider implementing this in future updates (not to mention the folks working on DaVinci Resolve). Frankly, I’m not particularly surprised at the results… analyzing and color balancing images is a high-function skill that computers are still mastering. My problem with the Analyze function is it’s toggled nature: On or Off. Auto Balanced is either On or Off - and its settings are inaccessible. Either you use the data, or you throw it away. There’s no way to go in there and tweak the settings… or to see what exactly the Analyze function did. Nor can I decide re-order the Analyze function in the filter stack – which I might want to do if it’s crushing blacks a bit too much and I want to dig out some of that detail. The Analyze function is a little too All-or-Nothing for my tastes. But – it doesn’t hurt anything either. It’s totally non-destructive. I’ll be advising clients and students to turn on this function when ingesting, since it’s easy enough to turn off while color grading. 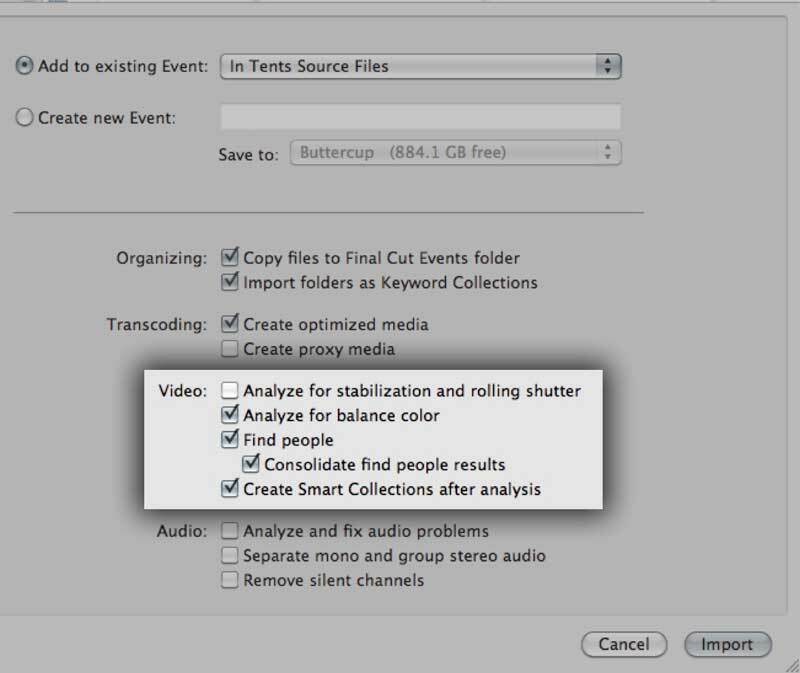 FCPx has video scopes (yay!). But there’s no way to turn off their colors (boo!). Of course, it’s purely a personal preference – but when grading I don’t want interface elements influencing my color perception… colored Parade scopes just aren’t necessary once you get used to them. Here’s to hoping the Pro Apps team agrees and allows for monochrome scopes. I couldn’t find a 2-up display to show both a Waveform and a Vectorscope. Hopefully that’ll be enabled in future updates. 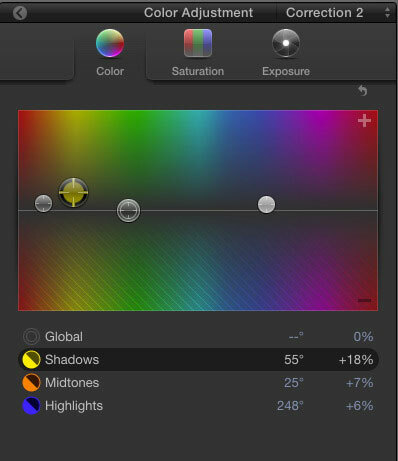 This is the heart of FCPx’s color grading toolset. Apple calls it the ‘Color Board’ – which initially confuses colorists who have control surfaces like the Wave or Artist Color. Unfortunately, no – FCPx 1.0 does not support external color grading surfaces. At first glance, the Board looks very slick. The controls are big (unlike the FCP’s 3-Way Color Corrector in which the target controls were very small). The color wheel is gone, replaced by a linear strip that echoes the powerful Hue controls in Apple Color and the forthcoming release of DaVinci Resolve 8. I believe it’s this interface (and it’s similarity to the Hue Curves) that had many pros believing (hoping, praying) that Color is being merged into FCPx. 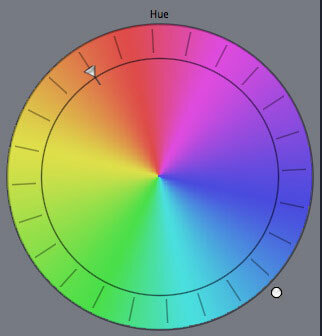 Unfortunately, the Color Board shares none of powerful controls of Apple Color’s Hue Curves but contains several of its shortcomings.Â My take-away: The relationship of the Color Board interface in FCPx and the Hue Curves in Color are strictly superficial. The FCPx user who’s just being introduced to color correction will find the Color Board self explanatory. In five minutes they’ll have it down cold. When they want more of some thing (say, Saturation in the highlights), they drag the control points up. When they want less of some thing (say, a Red color cast in the shadows), they drag the control points down. Terrific. Easy. No need to head to the user manual. But this website (and this blog) is about training professionals to use their tools to much greater effect than adjusting Saturation and correcting color casts. Essentially, Apple has broken down a complex tool into it’s minimum viable configuration (something at which Apple designers excel). The result: Unknowingly… beginner ‘Young Gun’ FCPx users are being locked into a mental model of color grading that is an island all its own. 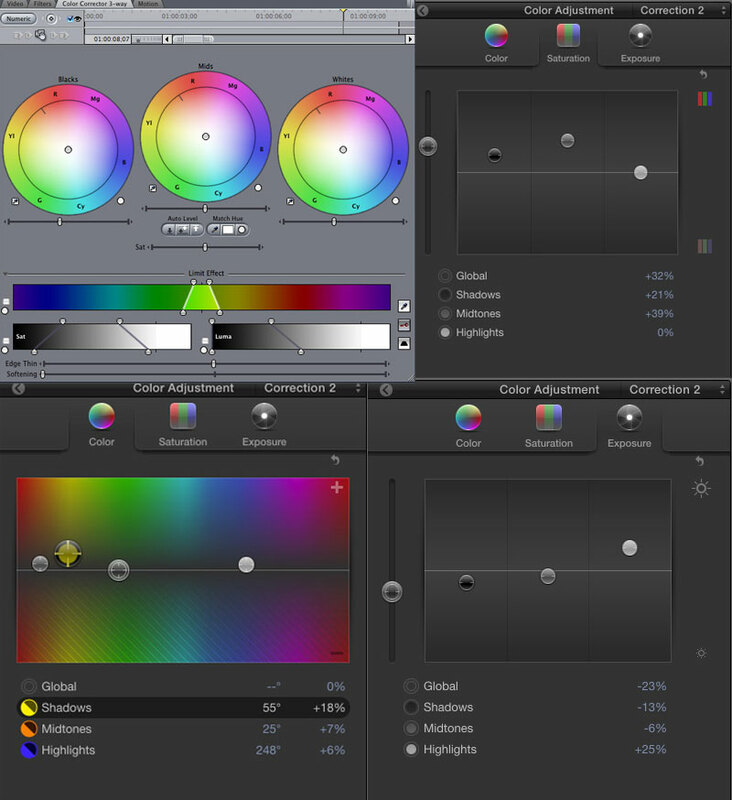 Re-stated: Apple killed the color wheel paradigm in FCPx – and these Young Guns may never understand how the color wheel works or why pulling out those Red overtones are introducing Greens (which it does in the Color Board – and as it should… color science being – science). And when they step out into almost every other NLE or Color Grading app in existence – they’ll be starting from scratch since there’s no common reference point between the Color Board and anything else on the market (before you flame me on this comment, I address this in the next section). There’s another problem with the ‘linear color wheel’ – lines have end points, but hues spin in a circle. When you want to get to a hue on the other side of an endpoint, in FCPx you’ve got to drag all the way across the line to the other end, watching your colors spin madly. In the grand scheme of life, this may seem nit-picky. But the color wheels in grading apps aren’t an abstract concept. They’re based in color science… in math. As you learn to use a color wheel you’re being unwittingly introduced into concepts that apply to almost every color grading workflow out there. The Color Board throws that all away for a simple, easy interface aimed atÂ (literally)Â the first-time user. Frankly,Â it’s designed for the David Pogue’s of the world – users who never stray far from presets and have no interest in turning the niche of color grading into a marketable skill much less into a valuable talent (which is the whole point of the ‘Tao of Color’ and the perspective of this blog). Criticize FCP 7’s 3-Way Color Corrector (3WCC)… but a beginner could take the muscle memory they learned while making hundreds and hundreds of adjustments in the 3WCC over many years, and immediately apply them to Apple Color, DaVinci Resolve, or Avid Media Composer. The same will never be said for FCPx’s Color Board. For those of us who have been using the color grading tools of FCP, Color, Resolve, Avid, After Effects, Color Finesse for any amount of time – we can take the (up to) 10 years of muscle memory we’ve developed while grading on a color wheel… and throw it away. I’m not saying we won’t adjust to it. I am saying we will have to rethink every single tweak we make. It took me 3 minutes to do a basic black balance on my first shot. I was laughing at my ineptness… until it wasn’t funny anymore. The Color Wheel isn’t some stodgy old notion of how to manipulate colors – again – it’s based on math, the additive color model, and the way opposing colors work and how light mixes together. It’s not some artisan design choice… or some digital version of an analog workflow – it’s a visual representation of underlying physics. And it’s one of many ways color scientists have developed to help people like us see and manipulate color of light that vary in brightness, vividness, and hue. If you’re going to throw away a visual model of the physics of mixing with light, you might want to do it in a way that improves upon it and makes our jobs easier… rather than shrink the craft to its single most commonÂ denominator. 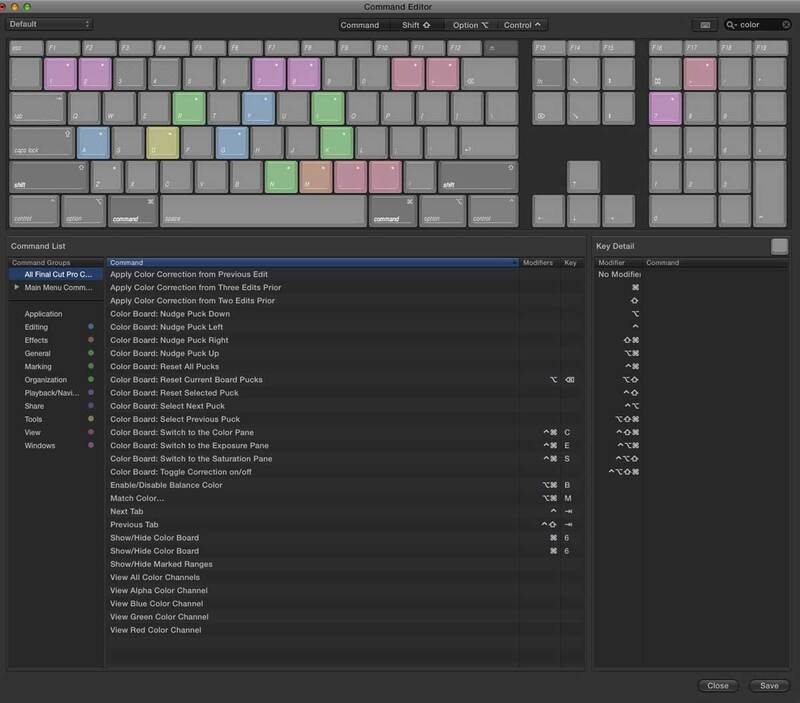 We’ll also be doing a lot more clicking in FCPx (although you’ll save a bunch of clicks by mapping most of the Color Board commands to the keyboard). Notice that the Color Board has added Shadow / Mid / Â High controls. And those added controls are present on EACH of the Hue, Saturation, and Exposure controls. This is a powerful upgrade. Exactly what I’d expect in a ‘next-gen’ product. But notice also that FCP 7’s 3-Way Color Correction filter contains 80% of the power of the Color Board – and does it within a single window. The Color Board requires 3 tabs to give us those Shadow / Mid / High controls. More powerful? Yes. But I can look at the 3-Way and know exactly what’s going on in that instance of the filter with a simple glance. The Color Board requires me to cycle through 3 tabs to make the same determination. So – we get more power, at the cost of speed. The exact opposite of what happens when you’re working in an app like Color or Resolve – where complexity is offset by exponential factors of speed and power (granted, they do require an external input device (a colorist control surface) to realize those full benefits). Here’s a positive note on the linear Color Board: Several other filters have been rolled into the Color Board – the global hue controls of the 1-Way Color corrector and the various ‘Hi / Lo’ Saturation filters are now just a tab away, rather than separate individual filters. By my count at least 4 of FCP 7’s color correction filters have been rolled into the Color Board. Stacking multiple grading filters is easy and works as expected. But it’s not possible to reorder them, which would be very useful. The masking tool works well – but if there’s tracking that can be applied, I haven’t figured it out yet. The eyedropper for making selections works well but is very very basic and a little confusing at first. FCP’s 3-Way HSL selectors are much more powerful… at the cost of complexity. In FCPx I can’t figure out how to narrow the selection to only Brightness or only Saturation or only HueÂ dataÂ (or some combination of those three) – which makes pulling clean accurate selections in FCP 7 much easier than in FCPx. I was also surprised that hovering over number readouts and scrolling the middle-wheel or dragging across the numbers don’t do anything. This would have been a great way to make more precise adjustments. Adding multiple correction filters is MUCH faster than in FCP 7. The biggest single omission is the RGB Balance filter. For years this filter has been the bazooka in my pocket, allowing quick easy control, specifically targeting color casts in precise regions. In FCPx, it’s gone. And there’s no equivalent replacement. Selfishly it’s not my initial reaction that I’m interested in. It’s YOUR initial reaction I’m interested in. If you know how to use the RGB parade to do a basic balance on your shots… I’d love for you to test it out and let me know what you think by posting in the Comments section below! Did it flummox you as much as it flummoxed me? Please share your experiences. Apple Color is NOT rolled into FCPx, as I’ve read many people speculate the past few weeks. In fact, nothing can be further from the truth. And while FCPx color grading is potentially more powerful than FCP 7, the decision to abandon the color wheel and split Hue, Saturation, and Exposure controls into 4 panels is likely to result in slower grading. At first blush, FCPx’s updated color grading tools are much simpler than FCP 7s. But they’re not more powerful. Filters are missing, HSL selections are dumbed down, the mental model is designed for the newly initiated – not the installed user base. These flaws subtract from the new integrated interface. And even my enthusiasm for the integrated HSL selection tool is tempered by its simplicity. I can’t state I prefer FCPx over FCP 7 – or the other way around. It’s a coin flip. 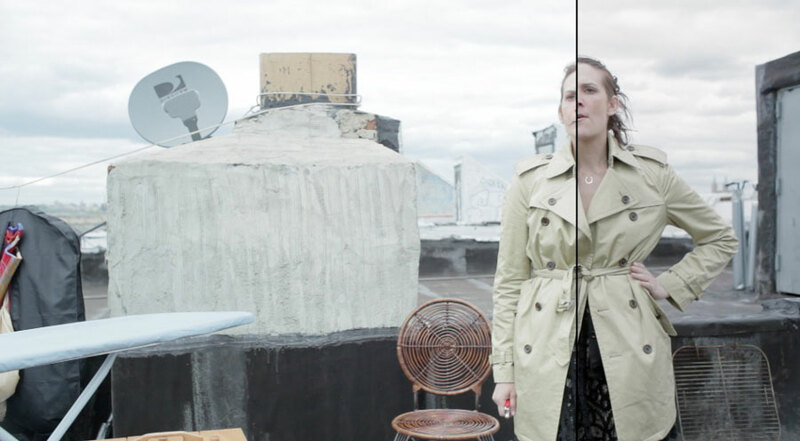 Yes, a professional-looking color grade can be obtained with the Color Board. I have no doubt about it. And FCPx will train many skilled artisans to use its toolset and use it well and for good effect… And I will develop training for those people who want to approach the craft of color grading using the toolset Apple has developed for FCPx. But the muscle memory being developed is one that’s only useful within the FCPx walled garden. In Apple’s desire to create a truly unique tool they threw away an industry paradigm (the color wheel) without replacing it with something more powerful. It may be simpler to initially use but it won’t build the foundation you’d hope it would if you want to eventually grow out of it. Disappointment mingled with a strong dose of Missed Opportunity. Color correction in FCPx is simpler for the David Pogues of the world to grasp, initially – but it comes with some serious drawbacks for anyone who wants to take color grading to the ‘next level’. Or who wants to build a skill set that can help them grow into dedicated color grading apps. Besides the fact that FCPx’s color grading filters are always only a keystroke away: Command-6 – the strongest feature in FCPx areÂ the Shadow / Mid / Highlight controls but the UI is spread out forcing lots of tabbing. Well, on Friday I’m diving into FCPx to start conforming the 14 minute short film used in Tao of Color’s Masterclass training program. And then I’m going to re-grade the entire film in FCPx. At the end of that process – I’ll report back if my opinion on these initial thoughts change… and then start developing an FCPx training add-on to the Tao’s Color Grading MasterClass series. FCP absolutely needed an overhaul. Heck – the entire NLE industry needs to rethink their interfaces and workflows. But when it comes to the craft of Color Grading – FCPx 1.0 is not doing anyone any favors. The tools have been given the gift of finesse (with all the Shadow / Mid / Highlight control points) while simplifying them so much it’s probably not worth the cost. 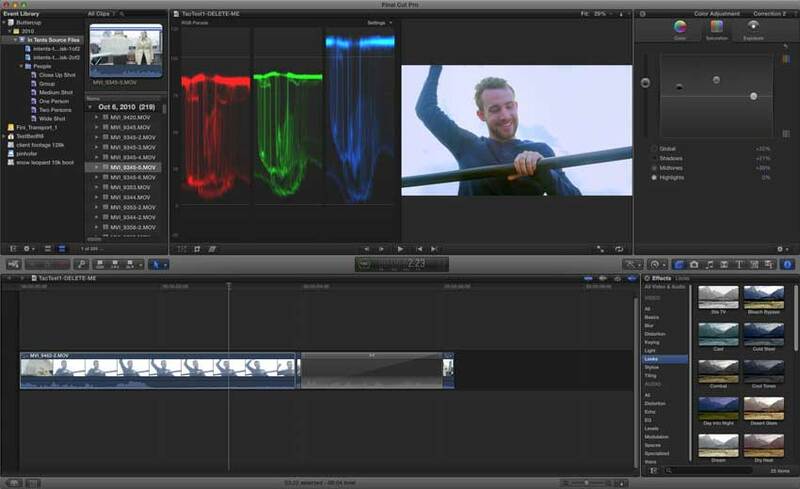 Import a shot into FCPx, use the RGB scopes to color balance using FCP’s Color Board, and report your thoughts back to this blog using the comments below. I’m really interested to see if people agree with me. Or not. And if you liked this post – then sign up for our Weekly Color Grading Newsletter… people LOVE it! Tao of Color has not received compensation, goods, or services from anything mentioned in this post. We hope, one day, this might change. Affiliate links are used throughout this website, sometimes resulting in a commission on sales (which helps support TaoOfColor.com) but without raising the price you pay by one cent. Feel free to leave comments, suggestions, and questions. This is Part 3 of this three-part interview with author, director, and colorist Alexis Van Hurkman. Alexis was kind enough to spend nearly 2.5 hours speaking with me about his career and insights into the art, craft and technology of digital color grading. This interview is part of an on-going interview series with the movers, shaker, and thinkers involved in the field of professional color grading for moving images. When I have new episodes to release, they are released on Tuesdays. 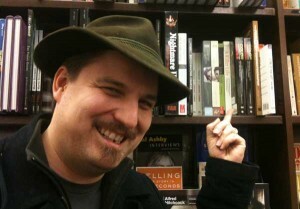 To be notified you may follow me on Twitter (@patInhofer), via our RSS feed, and eventually on iTunes. Here’s the main page listing all of my TaoOfColor.com interviews. Yes, I am an Amazon affiliate. Anything on this page that links to Amazon is most likely an affiliate link. If you buy anything from my affiliate link I get a 4% commission. Which about (but not quite) buys me a tall (small) latte from Starbucks.